This week we reviewed Functions and relations from grade 9. Functions are types of relation with only 1 connection with another number or variable or basically a special relation ship that you only have 1 of, like your spouse. 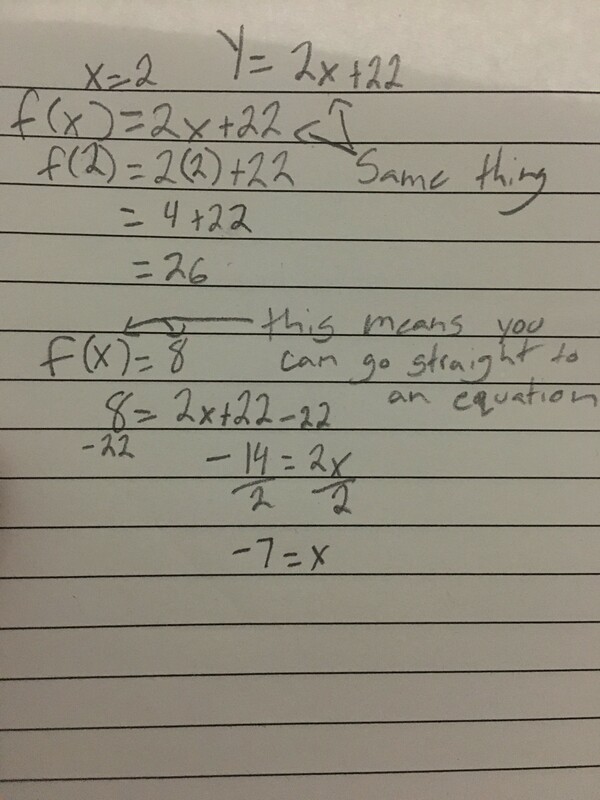 We also learned about function notation. 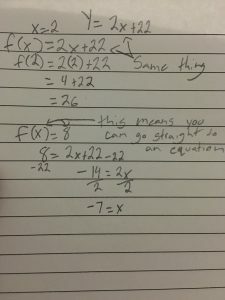 Function notation is a way a function is written and it is a different way then using the both X and Y in an equation. 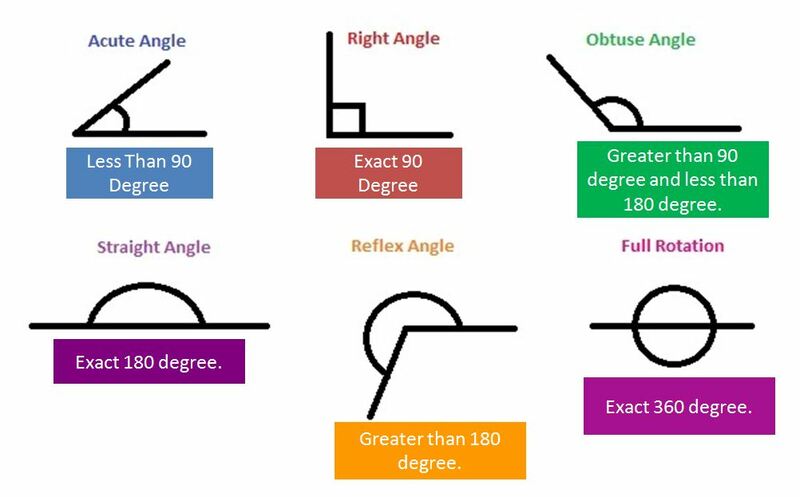 It is meant to be a way of giving information about the function without being a very long equation or explanation. The functions are usually a single letter like F or G or basically any letter. So this week in math we had our math mid term and since we just did review, we where asked to make an informative video from our previous units. 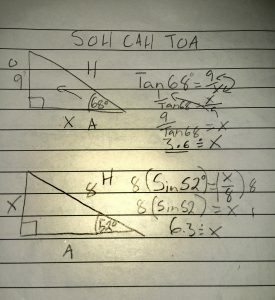 So I did trigonometry because I found that to be an easy unit. This week in Math 10 we finished off the polynomials and factoring unit. 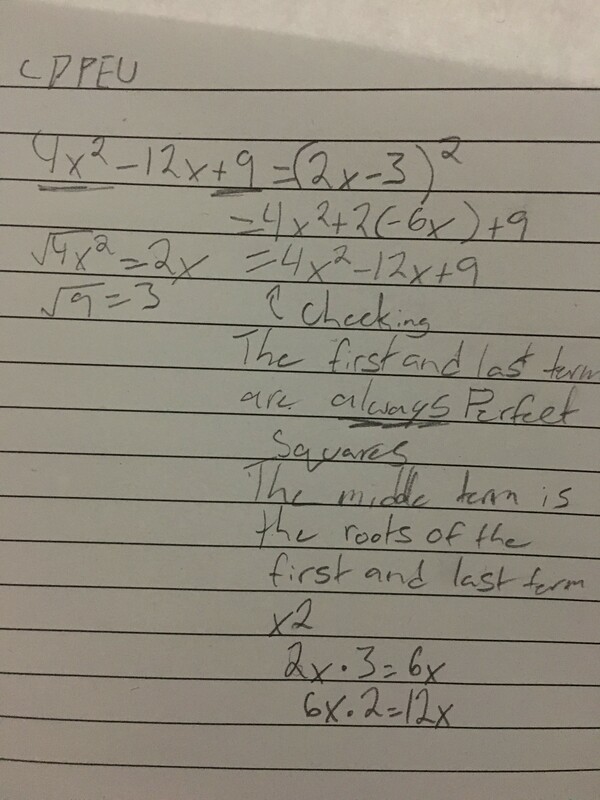 During this week we learned how to factor factor perfect trinomials in preparation for the unit test. 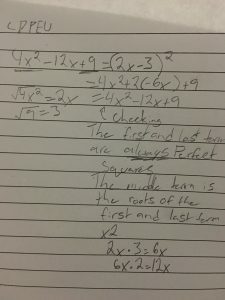 Here are some helpful hints on factoring perfect square trinomials: don’t for get to use CDPEU (Common factors, difference in squares, pattern, easy and ugly), The first and last terms are always perfect squares and the middle term is the root of the first and last term x 2. This week in math 10 we reviewed on what we did in math 9 on adding and subtracting polynomials. We also learned how to multiply binomials, and we also learned foil and distributive property. Foil stands for finding the product of the first, outside, inside then last terms. 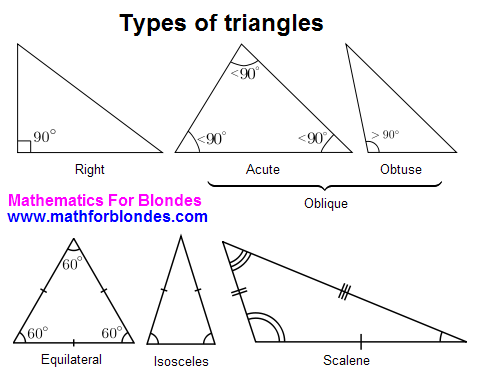 We also learned about the different types of binomials, trinomials, monomials, etc. There are so many ways to multiply binomials, but one way I found the easiest to multiply them is by using the area models. An area model is a simple to find the product of polynomials. You won’t likely miss one of the terms and you can use it with any type of polynomial. But you can only multiply 2 polynomials together. 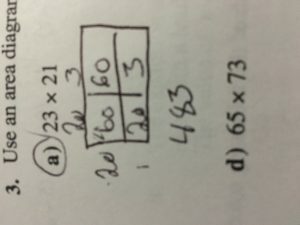 The first example is how the area model relates to multiplication and how you can use it for big multiplication questions. 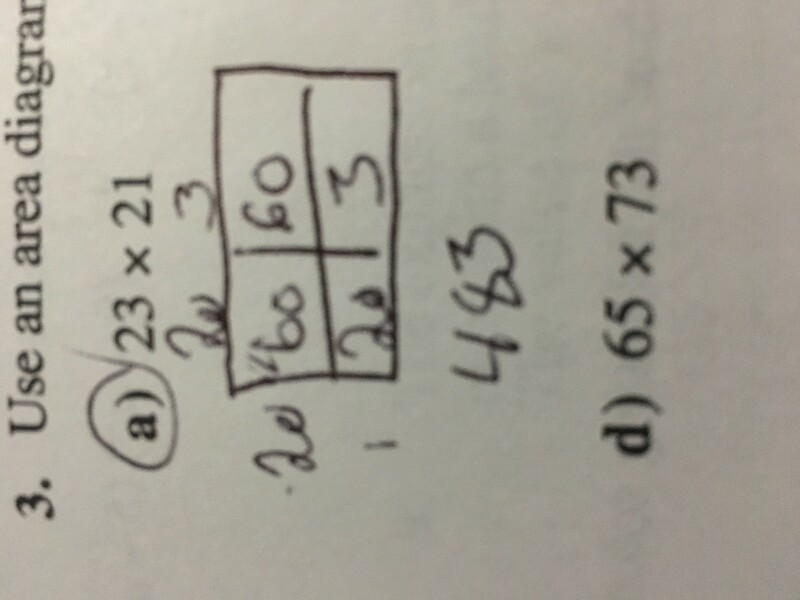 And the second example is how to easily multiply the 2 polynomials together. 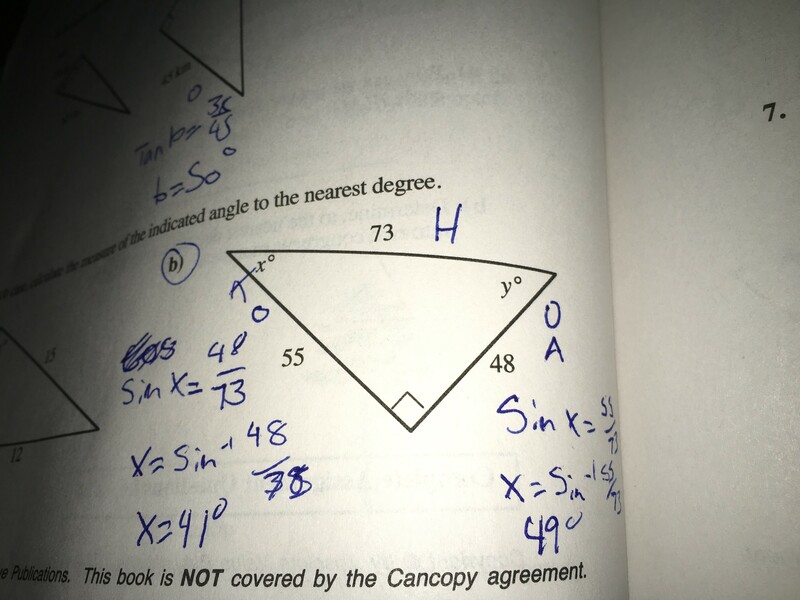 In week 7 of math 10 we got introduced to trigonometry which is finding the missing side or sides or the angle of the right triangle you are solving. 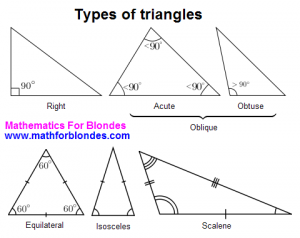 We first learned how to find the which sides are each the hypotenuse, the opposite and the adjacent. 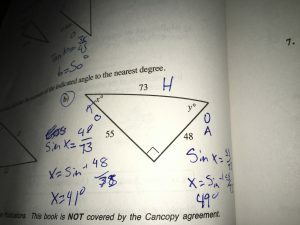 The hypotenuse is across from the right angle, the opposite is across from the reference angle and the adjacent is beside the reference angle. We also learned how to create equations from the numbers we are given. 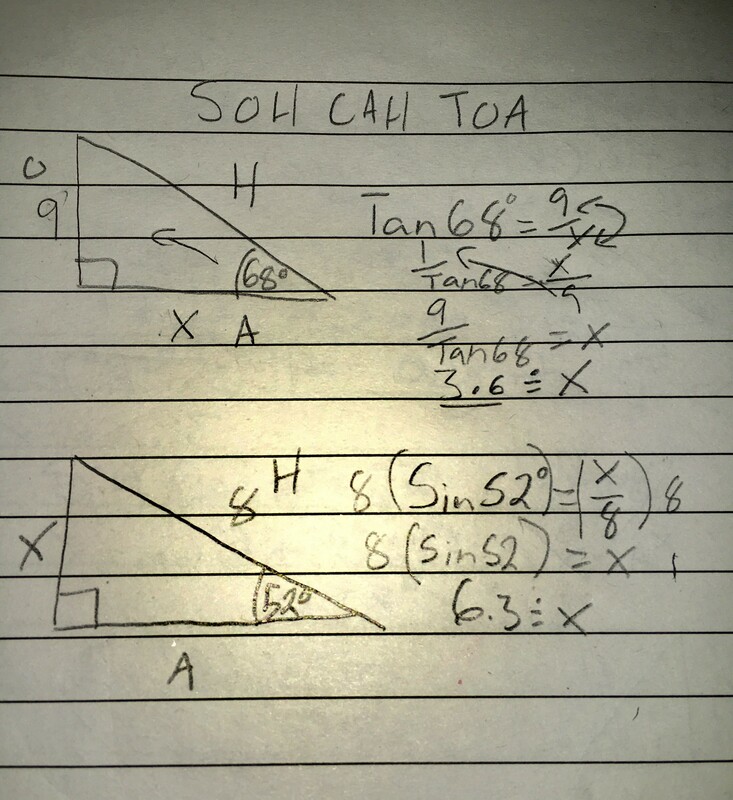 we learned to solve them using SOH CAH TOA which helps us find which button to press on our calculator (sin, cos, tan) SOH is sin = opposite / hypotenuse, CAH is cos = adjacent / hypotenuse and TOA = tan = opposite over adjacent. Also if the X is on the bottom of the faction you will have to reciprocate both sides to get the X on top. 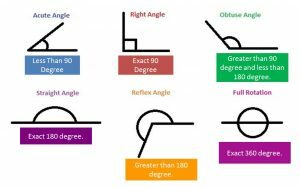 In week 6 of math 10 we continued the measurement unit. 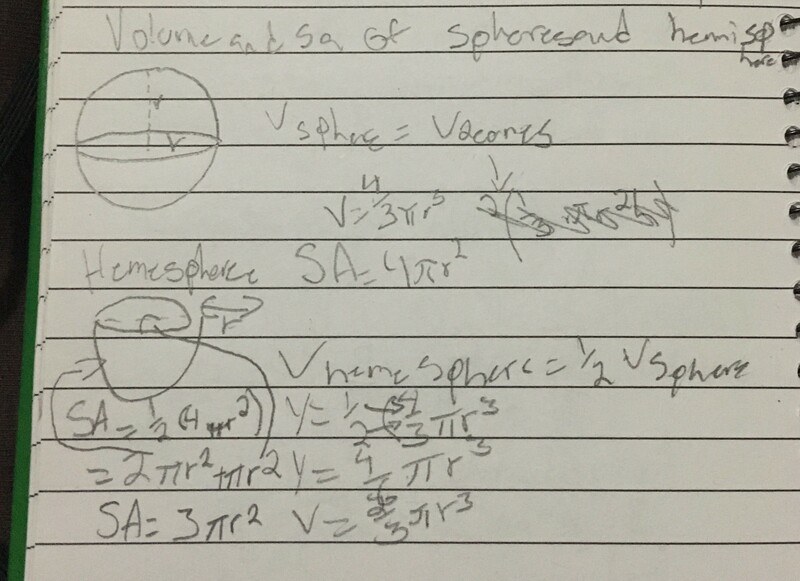 I was most interested in how to find the surface area and volume of a hemisphere, basically its half of a sphere. 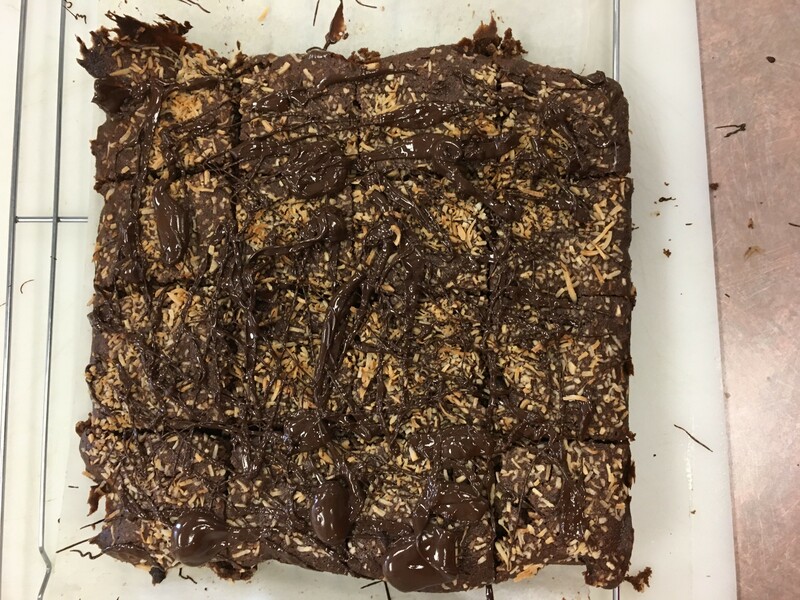 My unit made brownies BUT with a twist, we substituted the flower for whole wheat flour and the sugar for brown sugar, added a lot of coconut shavings and as well as a chocolate drizzle. this lab was very good and turned out absolutely delicious! Most of the team worked together very well through till the end. 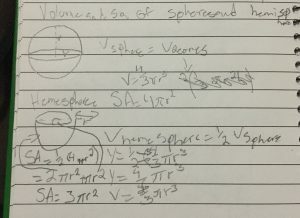 The best part about this lab was the finished product. 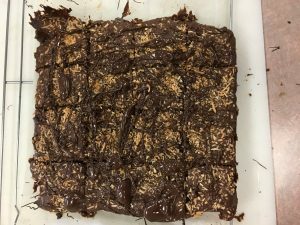 Yes there was a little bit to much coconut in the brownies but I think this was the best lab that our team has done yet! And the brownies turned out just a little bit under cooked, so it was just the right amount of gooeyness inside. 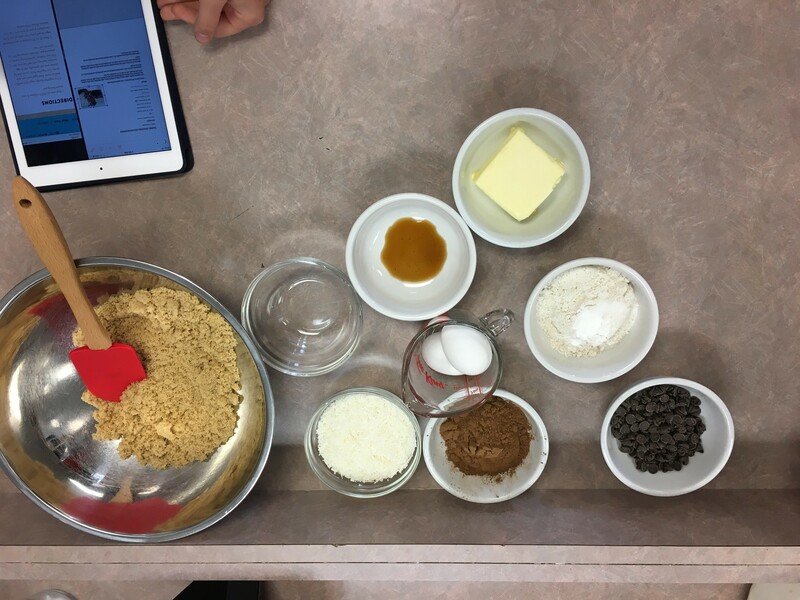 Our group was right on time and had time to spare with the bell to ring, we even had time for the brownies to set and cool and even put in the fridge for a little until we put the chocolate drizzle on top. 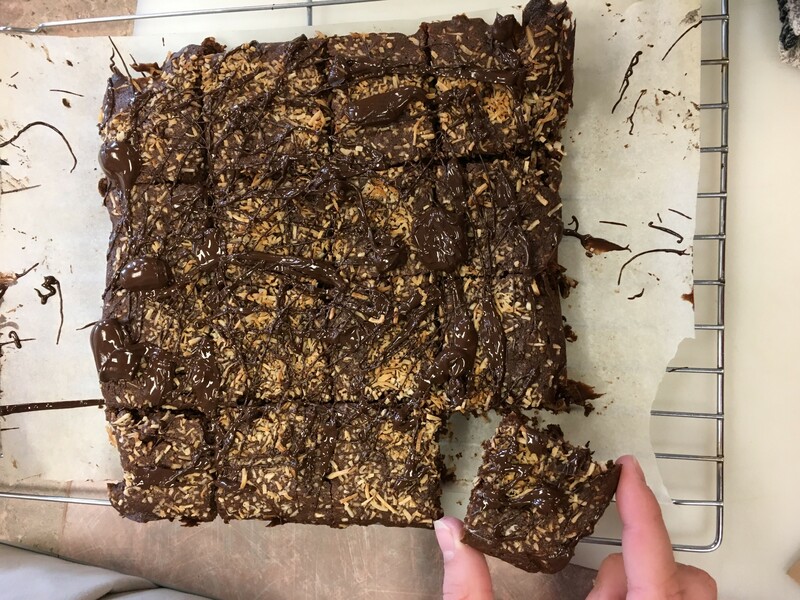 The only part I regret about this lab was adding the coconut, I’m not the biggest fan of coconut, a little is fine but the coconut was a little bit overboard in the brownies. We should of had one side without the brownies, I would of liked that, but I thought of it after the lab.